The new buzzword in the Corporate sector is work life balance. Companies want their employees to live fulfilling lives and remain productive at work so they have come with the concept of balance. A balance is necessary be it in personal or professional life as every person wants stability in life and career. Understanding the needs and requirements of the new generation working force, a lot of business houses have come up with the concept of work life balance where a person can adopt for flexi timing hours, work from home, fulfill other necessary urgent commitments during working hours and then come to work, work for allotted number of hours in a week, complete the work at hand and then rest for the remaining time. Employers are not leaving any stone unturned to get their work done. Today's work force is quite different from the previous ones or Baby Boomers. Our fathers and forefathers never heard of any such balancing policies and they were committed to 10 to 5 job with all ease and no grudges. But with the changes in lifestyle, thinking and fast changing technology employees want more flexibility, less restrictions, freedom to work and take decisions. This working class is hard to please and will leave if not satisfied. To meet the new demands of the Millennials ( Generation Y employees) companies have adopted new and improved policies to avoid attrition. High pay package is no more attractive if there is no career growth and flexibility in working conditions. It is good that employers have come up with all innovative ideas to retain employees to get their work done. All the top notch business houses such as Yahoo, Google and other Multinationals have adopted this concept. The employees are enjoying the improved policies and working conditions. There are other small companies who want to adopt it. Few things need to be kept in mind before a company makes new policies. The concept of work life balance is great but employees need to be managed well or they will take things for granted and the whole system will fail. 1)Employees will have to complete weekly task. If they fulfill other work and come to office late it is their responsibility to complete their days task, report it to the concerned manager and than leave. If employees come late and leave early without completing their task then the new policy is useless. Policies are made for increasing output, productivity and employee morale. 2)Work has to be checked and if there is lack of dedication towards work, action needs to be taken and the particular employee needs to be counseled. 3)Every employer has to check up to what extent the new changes can be brought in the organization and its impact. Every new concept and change is good but we have to check how we can fit in it and mold things according to our needs than only it can be a hit in our organization. 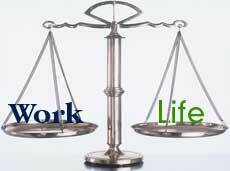 Work life balance is a great concept and it benefits a large working mass. Career oriented women who could not work before can now work both from home and and come to office for few hours, so that she can meet all family and work obligations. Working mothers found it difficult to get back to work due to the 8 – 9 hrs office stay, but the new work from home opportunities is a boon for them. Companies are getting benefited by hiring this new work force who has knowledge and fire in their belly to do something and stay ahead in life.